We want to calculate the total gravitational force caused by a planet of this shape at our position. To do this, let’s split up the planet into a series of disks. 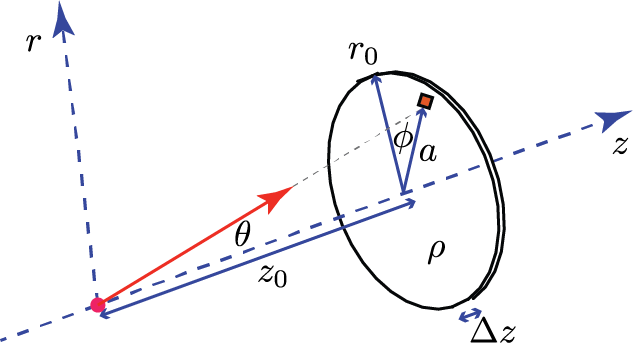 Suppose the disk at a distance has a radius . Also suppose it has density and thickness , which we assume is very small. Referring to the diagram below, we can calculate the gravitational force caused by the small mass element coloured in red. The gravitational force exerted on us is depicted by the red line. Due to symmetry, only the component along the -direction will matter, the other components will cancel out when we add the rest of the disk. Once we find the force due to this small component, we can integrate over the rest of the disk. Now in the above I’ve been notating these objects with square brackets to distinguish them from functions. Functions take a number and return another number. These things are functionals, which take a function and return a number. We are now trying to find a function which minimises a functional. Finally, we have a complete solution, which is plotted below along with a spherical planet of the same mass. 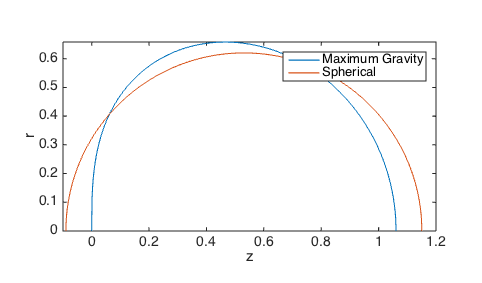 so the act of maximising the gravitational force has squashed a circular planet up towards the observation point, by modifying the exponent of the first term in the equation for . 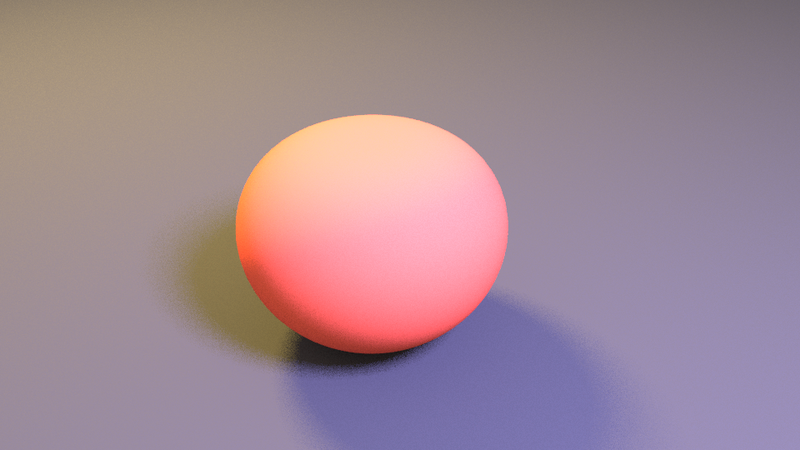 Here I’ve written a Python script for Blender to create and light the correct geometry. The -coordinate is now vertical (confusingly! 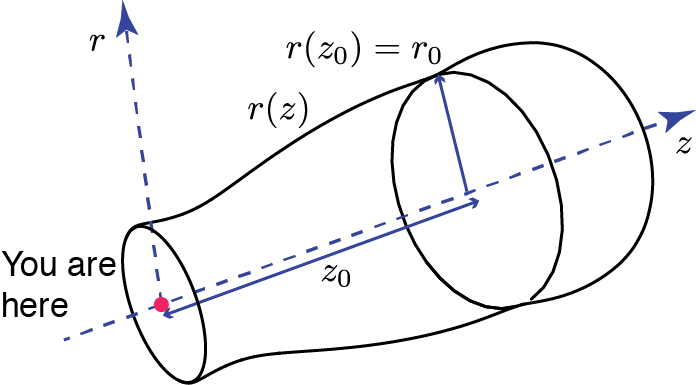 ), and the radial coordinate transverse. The top of this orb represents . It’s important to note that each frame is using a different spatial scaling – in each case the planet has the same volume and mass, but they’ve all been scaled uniformly to fit into the same vertical region. Switching back to unscaled coordinates, we can see below how the profile of the planets change when gravity operates in different dimensions. For , the best solution is actually a sphere again which is nice. 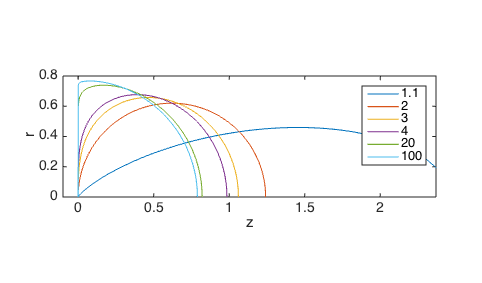 For lower dimensions the most important thing is to make sure the force of gravity is mostly along the -direction so that it doesn’t get cancelled out – the dependence on distance is so weak that its OK to spread the mass out a bit, as long as it’s mostly along the right direction (don’t be fooled by the above plot – all planets have the same volume!). For higher dimensions, gravity lessens incredibly rapidly with distance so it’s most important to squash as much mass as close to the observer as possible. This leads to the planets becoming a half-sphere shape. For the gravitational force becomes so large so quickly that the material nearest the observer causes the total force to diverge, so we should really restrict our attention to . As the mass of the planet changes we can see how the total force varies as a function of dimension. For sufficiently massive planets, the gravitational force in lower dimensions can exceed that from a 3-dimensional gravity. While this solution continues for , we should note that it isn’t actually possible to construct a planet there, as becomes imaginary (taking a fractional power of a negative number). Nevertheless, from a simple question we’ve managed to churn out a lot of maths and even a Python script. If you’d like to have a look, you can see it here. There is a line commented out at the end of the script where you can choose where to save the finished render. The rest should be self-explanatory, though if you have any questions feel free to comment below.